Plus size shopping can be hard to do online. AbbeyPost takes out the guess work when finding your perfect size and fit when shopping online. They’re giving away PayPal Cash to a lucky fan and their friend. Enter to win below! Good luck! Shopping is fun again! Join the AbbeyPost family and discover the newest and most exciting Plus Size designers, boutiques and brands chosen just for you. At AbbeyPost, we love who you are! Sick of struggling with finding the right fit when shopping online? Tired of squinting at fit charts, hassling with measuring tapes, and then being disappointed by the fit anyway? Sign up today to learn more about AbbeyPost’s exclusive “Find Your Fit” technology. This cutting-edge software scans your measurements from the privacy of your own home, then with one click of a button you see the items that perfectly fit your unique measurements and shape. Sounds pretty awesome, right? It’s fun, fast and free–and only available here at AbbeyPost. 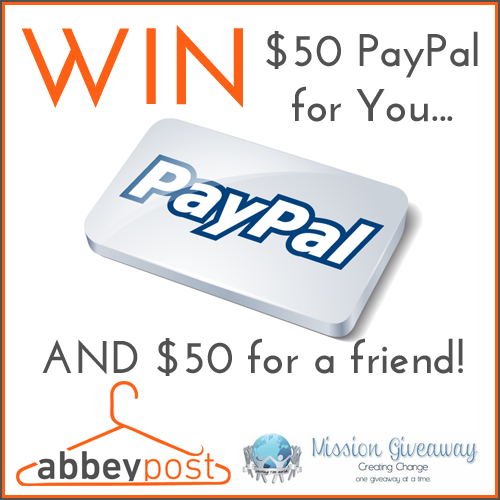 Abbey Post is offering 2 $50 PayPal Gift Cards – One for our winner and one for them to share with a friend. The Giveaway will open up on 8/27 12:01 am EST and Close on 8/31 at 11:59 pm EST. Open to US only. I would really love to buy some new clothes from Abbey Post. Fingers crossed!